Meagan Lane and Geoff de Mers, founders of Wammy nominated 2nd Story Band grew up in the '50s and '60s during one of the most musically rich periods in the evolution of American Pop Music. It was a time when Rock-a-billy, Doo Whop, R & B, Tejano, Calypso, Cowboy Music (C&W), Swing, Rock & Roll, Folk, and Folk Rock could be heard on commercial radio. In fact since 1978, as a result of their ability to incorporate these and many other styles including West African, Latin and Celtic, Meagan and Geoff have developed one of the most interesting and fresh sounds to come out of the Metro Washington, DC area. Meagan has a smoky, expressive vocal style and Geoff's vocal harmonies and leads are a great complement to the sound. Meagan plays a massive acoustic bass guitar providing melodic and propulsive rhythm and also kalimba (African thumb piano). Geoff plays acoustic rhythm and lead guitar and slide guitar, flute and harmonica and adds guitar synthesizer samples simulating instruments like Caribbean steel drums (pan), Andean flutes and piano adding spice to the flavors in the mix. Over their 40 year career together Meagan and Geoff have worked with some of the very finest musicians in the area from various countries and cultures, especially on Drums, Percussion, Violin and Bass. As an example: in 1990 they formed a West African Band, Hedzoleh Story in collaboration with Amartey Larea, a multi-instrumentalist, singer/song-writer from Ghana, West Africa. Their shows included performances at the Smithsonian Museum of African Art and Harmony Hall Regional Arts Center during African History Month. The African based music and dance grooves dramatically influenced the duo's musical growth and songwriting. Inspired by these rhythms and grooves the 2nd Story Band Duo developed an exciting new style, a jammin' World Beat Blend of funky Blues & Swing, West African, Caribbean and Pop Rock rhythms. They call it "World Beat Blues" . 2nd Story Band can perform as a Duo or as a Trio with an Afro/Latin percussionist. In the Band Days a 2nd Story Band performance invited theaudience to participate in various ways: call and response, playing authentic African hand percussion instruments and dancing, etc. And there was the magical "limbo stick" which Meagan and Geoff sent out into the audience for the children of all ages who love to see "how low they can go"! Meagan and Geoff feel it is important to give back to the community. For the past several years they have been giving regular performances at assisted living homes and senior centers in addition to community pool parties, restaurants, concerts and house parties. They enjoy ad-libbing on stage, chatting with their audience and giving insights into the various musical styles and instruments they play. Way back in 1977 in a little Bethesda hole-in-the-wall called the Psychedelly, Geoff de Mers and Meagan Lane found musical harmony while both singing at an “open mike”. Geoff had been writing original music and had released an LP of all original songs, self titled "Geoffrey", on the Concert Arts label in 1972. He was enjoying a very successful career teaching music (Guitar, Mandolin, Appalachian Mountain Dulcimer, 5 String Banjo, and Bass) at Charlie Byrd's Music House in Bethesda, Md. when he teamed up with Meagan, who had recently been the lead singer in the well known psychedelic jazz/rock band, Grow Your Own. The duo began performing all over the Washington, D.C. area including Fredericksburg, VA, Maryland - Baltimore, Frederick and Ocean City - and as far a-field as New York, Norfolk, Va. and Saint Croix in the Virgin Islands. Over the next few years Meagan and Geoff sought out musical talent in the area, notably: John Previty on upright bass, who inspired Meagan to take up the instrument; Dan Cassidy, brother of the late Eva Cassidy & Wacek Kozlowski, an extremely gifted player from Poland on electric violin; and Wes Crawford & Alejandro Lucini, a native born Brazilian player on drums and percussion. In 1980 the group became known as 2nd Story. The band’s sound was influenced by the diversity of the Washington area music scene: traditional music to Folk-Rock and Pop into Country, Blues and Swing, Irish and Celtic, into Funk and R & B and finally to West African and Latin grooves. A revolutionary phase of the group's development began in 1990 when Meagan and Geoff formed a West African Band - Hedzoleh Story - with drummer Bilo Ray & Amartey Larea, a multi-instrumentalist singer/songwriter from Ghana, West Africa, from whom Meagan and Geoff learned first hand how to play West African "Highlife" and other rhythms from the continent. They performed at the Smithsonian Museum of African Art and Harmony Hall Regional Arts Center for a concert celebration of African History Month. In 1991 Meagan and Geoff began to learn East Coast Swing dancing. They became completely absorbed in the dance community and progressed on to other African influenced dance styles of Lindy Hop, West Coast Swing and Zydeco and then finally the actual West African Dance styles. The African based music and the dance grooves had a dramatic effect on the group and on the duo's musical growth. Meagan and Geoff formed the "2nd Story [World Beat Blues] Band" and began to write new music and arrangements for the band based on these rhythms and grooves. They also hired West African Dancers to perform as part of the band's musical show. When the band broke up in 2000, Meagan and Geoff went back to performing primarily as a duo and Geoff gave up the electric, returning to his acoustic guitar roots. At that time Meagan switched to acoustic bass guitar. The duo had come full circle. Currently Meagan Lane and Geoff de Mers are enjoying their 40th anniversary of playing music together. They perform concerts around the Washington, D.C. area and in restaurants, pubs, and Assisted Living Homes and Senior Centers where they are having great success with their warm and energetic presentation and unusual brand of musicianship and eclecticism. 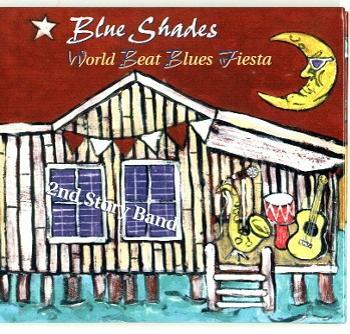 Meagan and Geoff have recorded two CDs: Blue Shades - World Beat Blues Fiesta & The Politicians All Sing - Origins and Originals which has complete song lyrics available through www.CDbaby.com/2ndstoryband. And Geoff has released Rainbow Lady and The Basement Tapes, a remastered 2 CD set of his original 1972 album, Geoffrey along with a 2nd CD of live and previously unreleased songs, full liner notes and song lyrics also available through www.CDbaby.com/2ndstoryband. 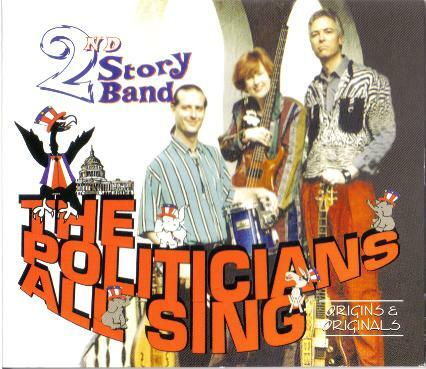 The songs on 2nd Story Band's most recent CD release, The Politicians All Sing - Origins & Originals, are snapshots in time - From light metal riffs to bouncy African grooves to Calypso and Caribbean moods, complimented by soaring guitars and violins, provocative lyrics, playful and edgy vocals. "I wanted to take a moment to thank you and 2nd Story Band for performing at our Holiday function in December. We thoroughly enjoyed the music. Your band was the perfect complement to our evening's festivities." "Meagan's sultry voice is only enhanced by the curious and provoking lyrics she emits. Catchy. The band, which could be a solid opener for the likes of Gloria Estefan, backs her with a variety of vibrant rhythms, haunting harmonies and a soothing style."